Apical surgery refers to a surgical procedure that is sometimes required (in less than 2% of cases) to remove infection from the tip of the roots of a tooth. This is usually caused by embedded bacteria that colonise on the outside of the root or in the surrounding bone. This resistant disease process is usually caused by “biofilm” (dental plaque). Root tip resorption also sometimes calls for an apicectomy. 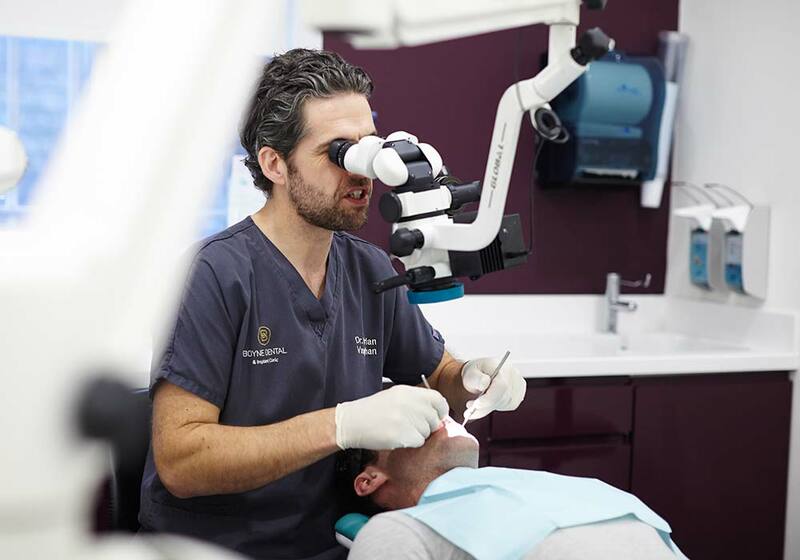 Apicectomy is a rare occurrence these days as the vast majority of root canal complications can be treated non-surgically through the tooth with the aid of cutting edge materials and the microscope that we have available here at Boyne Dental & Implant Clinic. Another reason for this procedure would be damage to the root tip area caused by chronic infection or damage caused by a dentist when the initial root canal treatment was done. The root canal system is a delicate system and damage can easily occur if correct treatment protocols and skill are not applied. What’s involved in an Apicectomy? When would I need apical surgery? Apical surgery is needed when conventional root canal treatment is not enough to get rid of the root canal infection/damaged root tip. This can be caused by resistant bacterial strains that are well embedded in biofilm beyond the root canal system in the surrounding bone/external root surface. Another reason for this procedure would be damage to the root tip area caused by chronic infection or damage caused by operator error when the initial root canal treatment was done. The root canal system is a delicate system and damage can easily occur if correct treatment protocols and skill are not applied.